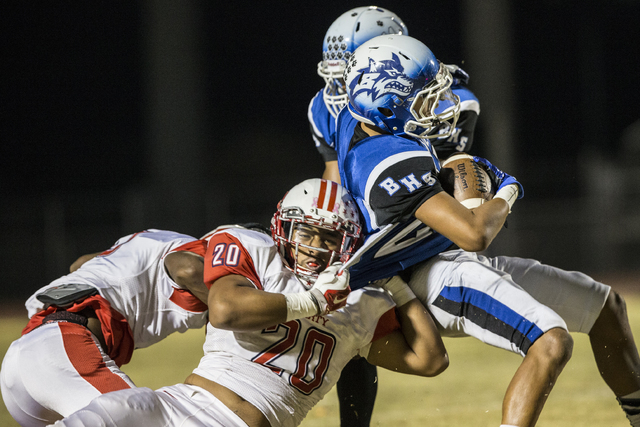 Here’s a look at what happened during Week 10 of the high school football season. 1. Even a sloppy Liberty is tough to beat. But the Patriots might want to clean things up now that they’ve finished the regular season. Liberty was penalized 20 times for 185 yards on Thursday, but still rolled to a 51-15 win over Basic. Liberty’s defense was outstanding, limiting the Wolves to negative-18 rushing yards and forcing four turnovers. The Patriots intercepted Basic quarterback Aaron McAllister three times. McAllister had thrown four interceptions all season entering the game. Ethan Dedeaux and Darion Acohido proved to be big-play threats to carry the Patriots. Dedeaux had a 65-yard TD reception and a 79-yard TD run. Acohido had a 63-yard punt return for a score, and a 7-yard TD run. He also had a spectacular receiving touchdown wiped out by one of those penalties. Acohido caught a pass near the Basic 40, somehow fought off three defenders and raced to the end zone to complete what would have been a 71-yard TD reception from Kenyon Oblad. But several of Acohido’s teammates ran onto the field early to celebrate, erasing the touchdown. 2. We might have written off Palo Verde and Centennial a little early. Both teams upset top-10 squads on Thursday to keep their playoff hopes alive. Palo Verde earned a 24-9 win over No. 10 Shadow Ridge, and Centennial rolled to a 55-21 win over No. 7 Faith Lutheran, keeping things interesting as we head to the final week of the regular season in the Sunset Region. Only four Sunset playoff berths have been secured, and only Cimarron-Memorial and Clark have been eliminated from the postseason. Arbor View has clinched the Northwest’s No. 1 seed, and Faith Lutheran the No. 2. But Legacy, Palo Verde, Shadow Ridge and Centennial all are still alive for the final two spots. Palo Verde, which started the season 0-6, can somehow still get a No. 3 seed if things shake down the right way. Things aren’t all that much clearer in the Southwest, where Bishop Gorman and Sierra Vista will play for the league title next week. Durango, Bonanza, Spring Valley and Desert Oasis are still alive for the final two playoff spots in the Southwest. 3. We get a Desert Pines vs. Moapa Valley matchup in the Class 3A playoffs, and that’s almost always a good thing. The Pirates have eliminated the Jaguars the last two seasons, beating Desert Pines 42-36 in overtime for the Division I-A state title in 2014, and winning 13-12 in last season’s state quarterfinals. Desert Pines has been the favorite in Class 3A all season, even after losing standout quarterback Marckell Grayson to a knee injury in Week 1. But the Pirates have won six of their last seven games, and it’s tough to bet against a Brent Lewis team in the postseason. Moapa Valley has advanced to the state championship game 10 times since 2004. Centennial 55, Faith Lutheran 21 — The Crusaders seemed to be rolling, having won four of five games down the stretch to clinch the Northwest League’s No. 2 playoff seed and moving to No. 7 in the latest coaches poll. But Jamaal Evans and Centennial absolutely destroyed Faith Lutheran on Thursday. Evans completed 20 of 27 passes for 217 yards and three touchdowns, and rushed for 106 yards and four scores. Receiver Savon Scarver was held to one catch, but the Bulldogs found a way to get him involved, as he had seven carries for 143 yards and a touchdown. Centennial racked up 643 yards of offense, including 426 on the ground as the Crusaders continue to struggle to stop the run. — Liberty coach Rich Muraco after his team beat Basic 51-15 to claim its sixth league title in the past seven seasons. — Chaparral receiver Kentrell Petite, who caught an 11-yard touchdown pass with 2:02 remaining to give the Cowboys a 29-26 win over Cheyenne. — Foothill coach Marty Redmond after his team defeated Green Valley 20-9 to claim the Southeast League’s final playoff berth. — Spring Valley’s Joseph Pienta, who blocked a potential game-winning field goal in the closing seconds to allow the Grizzlies to hang on for a 14-13 win over Desert Oasis. — Bishop Gorman coach Tony Sanchez after his team defeated Durango 56-0 to improve to 10-0. — Shadow Ridge coach Travis Foster after Palo Verde topped the Mustangs, 24-9. A look at how the top 10 teams in the Southern Nevada Football Coaches Poll fared in Week 10. 1. Bishop Gorman (10-0) beat Durango, 56-0. Next: at Sierra Vista, Friday, Nov. 4. 2. Liberty (8-1) beat No. 6 Basic, 51-15. Next: vs. Valley, Friday, Nov. 4. 3. Arbor View (7-1) was idle. Next: vs. Cimarron-Memorial, Friday, Nov. 4. 4. Canyon Springs (8-1) beat Rancho, 35-0. Next: vs. Foothill, Friday, Nov. 4. 5. Desert Pines (9-1) beat Del Sol, 42-7. Next: vs. Moapa Valley, Friday, Nov. 4. 6. Basic (6-3) lost to No. 2 Liberty, 51-15. Next: vs. Eldorado, Friday, Nov. 4. 7. Faith Lutheran (5-4) lost to Centennial, 55-21. Next: Sunset Region playoffs. 8. Legacy (6-2) beat Cimarron-Memorial, 41-14. Next: vs. No. 10 Shadow Ridge, Friday, Nov. 4. 8. Silverado (7-2) beat Coronado, 41-13. Next: at Las Vegas, Friday, Nov. 4. 10. Shadow Ridge (5-3) lost to Palo Verde, 24-9. Next: at No. 8 Legacy, Friday, Nov. 4. For complete coverage of all of the games from Week 10, visit nevadapreps.com.